Wide white stripe extending like a bonnet across the top of its head and bright orange-red bill. Their feet and bill are yellow and their eyes are brown. They have a more prominent tail than most other penguins. 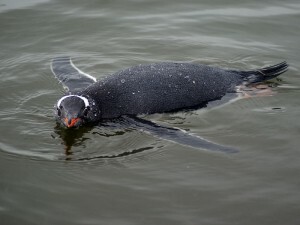 Their life span in the wild is estimated to be 15-20 years and they are the third largest of all the penguin species and are known to be the most curious.